Please read our flight stories, watch the videos, and enjoy the pictures. 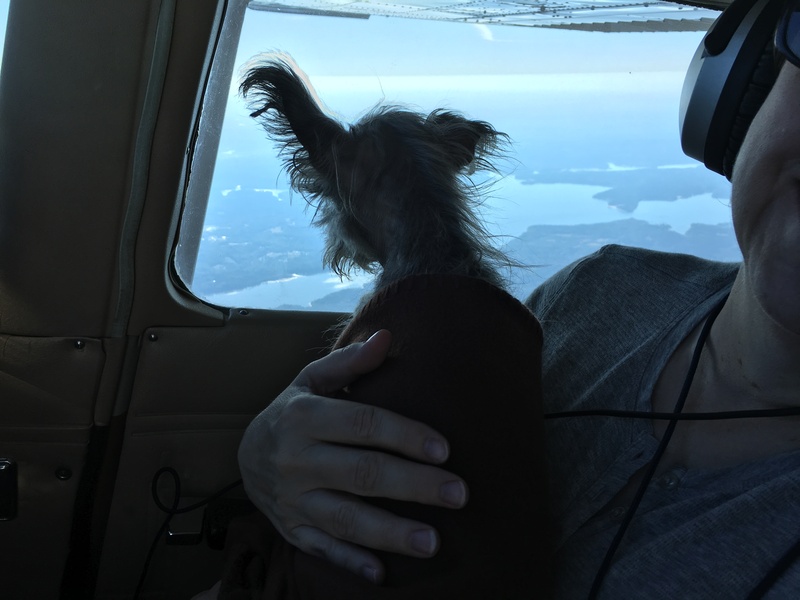 Every flight we make is special and every dog is a joy to know. A year ago today, was our last official Pilot.dog rescue flight that Steve and I flew, four dogs. 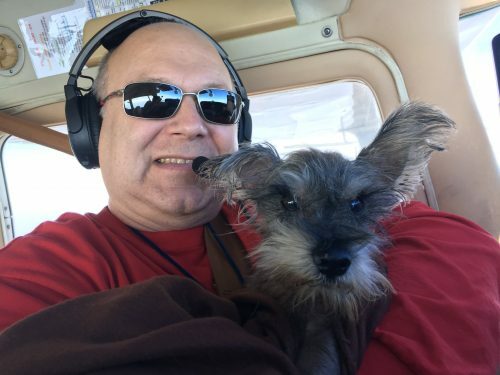 There was this one little dog named Canyon, he almost didn’t make the flight because his health certificate wasn’t with his paperwork. 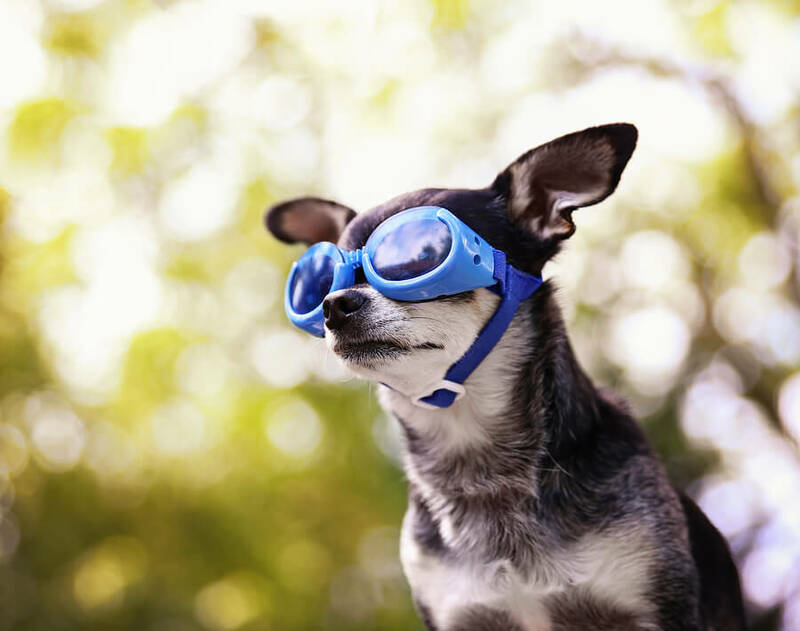 It’s illegal for us to fly a dog across state lines without a health certificate unless we own the dog. 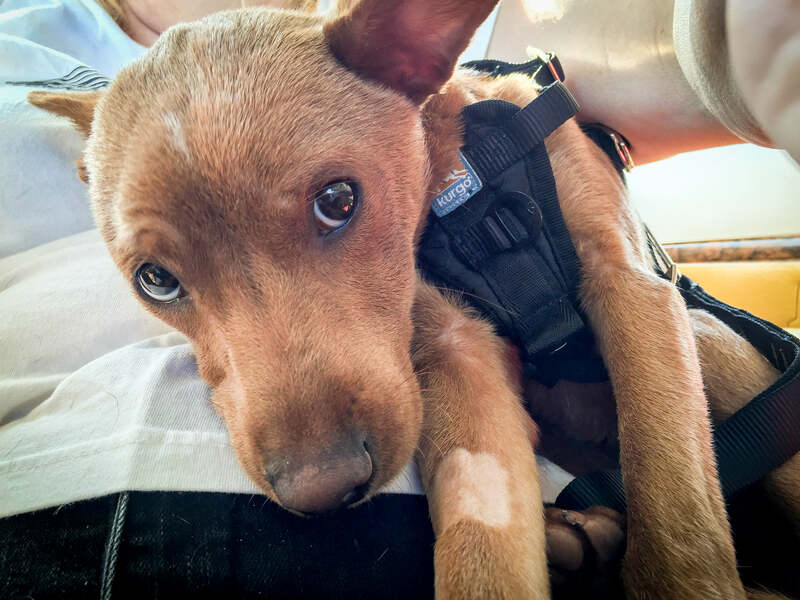 His foster was on vacation and when he was picked up the wrong packet was grabbed. We had to turn him away, and he was being taken back to the rescue when a copy of his health certificate was sent to my phone. We were actually on the tarmac awaiting flight clearance when I got the call. I ran back into the FBO and waited for the driver to bring him back. Canyon was a mess, he weighed all of 7.5 lbs, had hardly any hair due to an awful flea and tick infestation, had no teeth and smelled really bad. He must have thrown up in his crate and had rolled in it. Steve kept calling him Mr. Stinky. 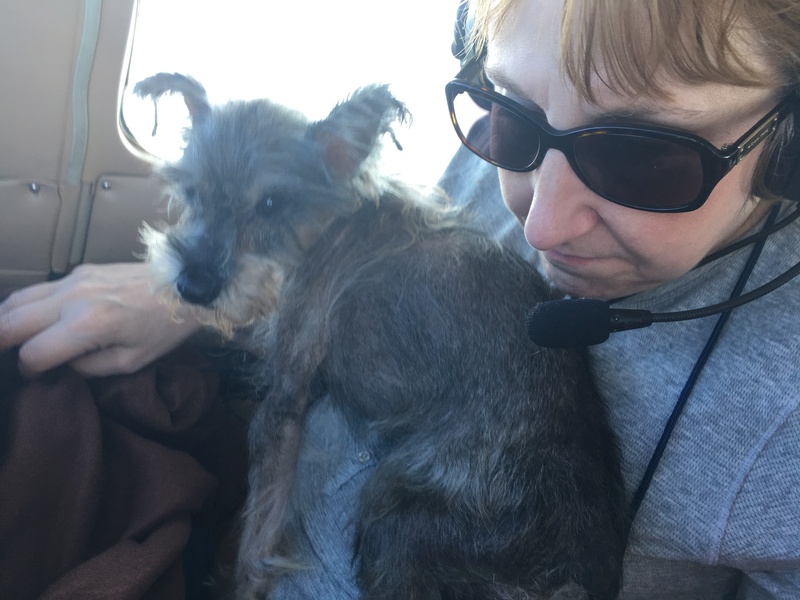 I didn’t care, I held him on my lap while we flew north to meet a connecting flight in MD where he and his flight mates would be flown to a rescue and adopted in NJ. 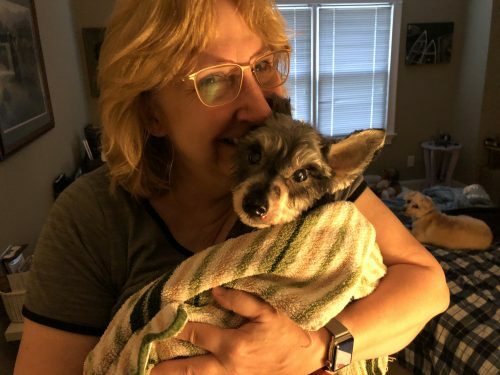 Canyon was found wandering in a field in rural Granville, NC and what teeth he had left were either rotted or infected, so the poor little guy had to have all of them removed. The receiving vet thought he was about 8 years old, his back was hunched, and his back legs weren’t very strong. He couldn’t jump up or stand on his back legs to beg. But there was something about this little guy that touched my heart deeply. Canyon loved flying. He would just look out the window and watch the world go by. We had a mechanical problem on the flight and had to land at an airport that was not our destination. On the way down, I thought if we didn’t make it at least this little guy and I had each other to hold on to. We made it safely on the ground, but I was done with rescue flying after that. The pilot meeting us had to fly to the new airport to meet us and pick up Canyon and the other dogs to take them to NJ to The Eleventh Hour Dog Rescue. Canyon had a family waiting to adopt him. When Canyon left, I held him and wished him a long and happy life with his new family. I thought I’d never see him again. We were stuck in Cambridge, MD where the plane was unable to fly, and we had to leave it there to be fixed. It was a long day for us. We had to find a way to Baltimore Washington International Airport to fly back to NC on Southwest Airlines. The entire time, all I could think about was Canyon. I even called the rescue that sent him up to NJ to tell them that if something happened to his adoption that I wanted to adopt him. I was obsessed with this little guy. 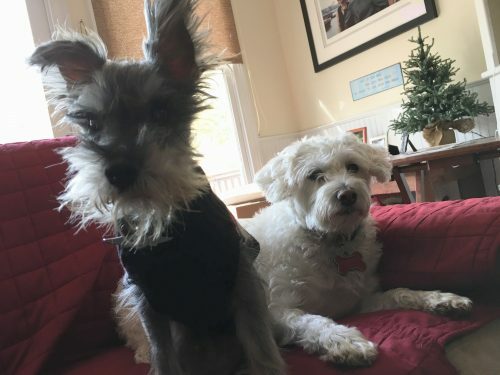 The next day I called to see if they’d heard anything from The Eleventh Hour as to how his adoption went but they hadn’t, and as soon as they did, they’d call me. I was impatient, all I could think of was Canyon all alone and scared. So I looked up The Eleventh Hours Rescue and called them myself. I found out that once the adoptive family found out he didn’t have any teeth, they didn’t want him. I was outraged! What kind of people didn’t want a dog because he didn’t have teeth?!?! I wanted him! I got in touch with the owner of the rescue, Carryl and told her I wanted him! I’d either drive or fly up and get him. Carryl was awesome, she knew he had a slim chance getting adopted in his current condition. 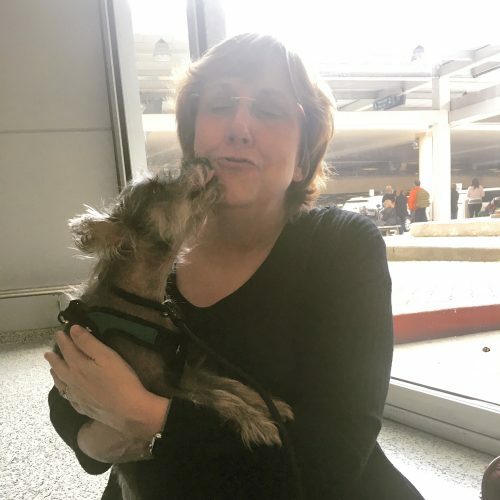 So, three days later on October 25th I flew up on United Airlines with a soft dog carrier to Newark Airport and a wonderful volunteer, Cindy, brought Canyon to the airport to me. Cindy was just as taken with Canyon as I was. We flew back to NC, first class so Canyon could easily fit in his carrier under the seat in front of me. Nothing was too good for our little boy! 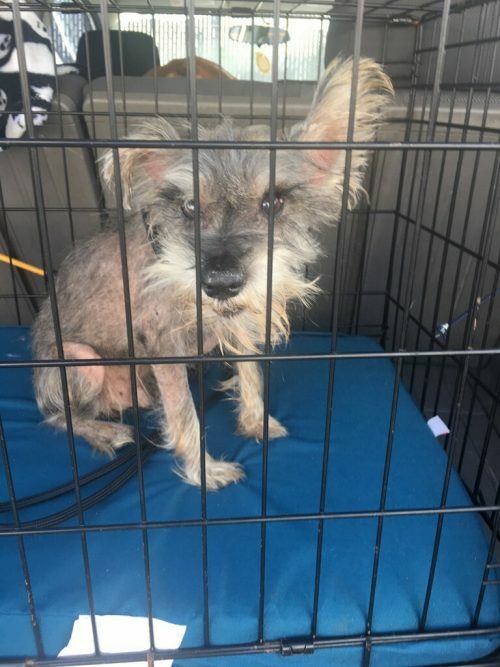 Canyon was underweight, on medication for his liver and antibiotics because he’d just been neutered and had all of his teeth pulled. Not to mention he looked a little like a Chinese Crested dog. We brought him home and introduced him to our girl Schnoodles, Jamie, and Brandy. Jamie wasn’t too sure of him, so we kept them separate until she was more comfortable. Canyon was great, he wasn’t bothered by either one of them. We needed a new name for him because we thought Canyon just didn’t fit him plus it was the name that the rescue gave him when they found him, so he wasn’t attached to it. Our son-in-law Travis came up with the perfect name for him, Karl. Karl is the name of the character from the movie, “Sling Blade” with Billy Bob Thornton. Travis sent us a clip of the pictures we took on the flight of Canyon with the voice of “Karl” from the movie. It was perfect! If Canyon had a human voice, it would be that of Karl from “Sling Blade.” So Karl became his official name. He responded to it right away! As the weeks went by, Karl blossomed! His hair grew back, and he became stronger and healthier. 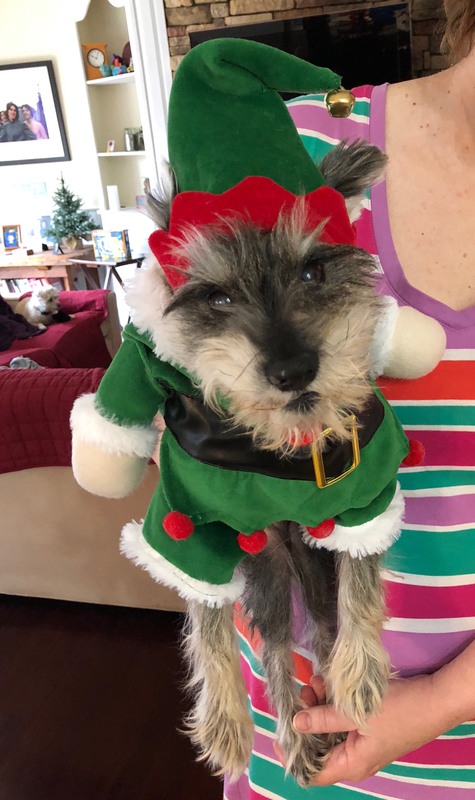 By Christmas, he wasn’t the same dog. Our love for him was unlimited, and he made our home complete again. 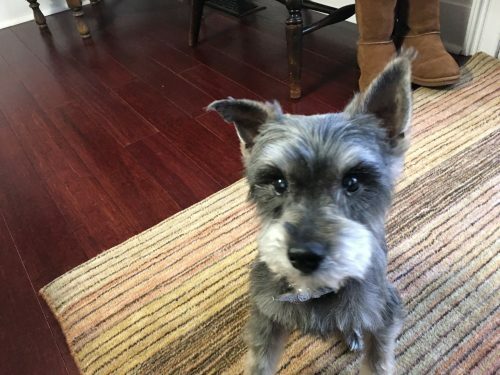 Two years prior we lost our male dog Dude to old age. Dude was a special boy, and though no other dog could take his place, Karl helped us complete the family circle again. Karl and Steve bonded, when Steve would go up to his office to work each morning he’d say to Karl, “let’s go to work” and Karl would follow him up the steps and spend the morning up there with Steve. Either on his lap or in his bed next to Steve’s desk. 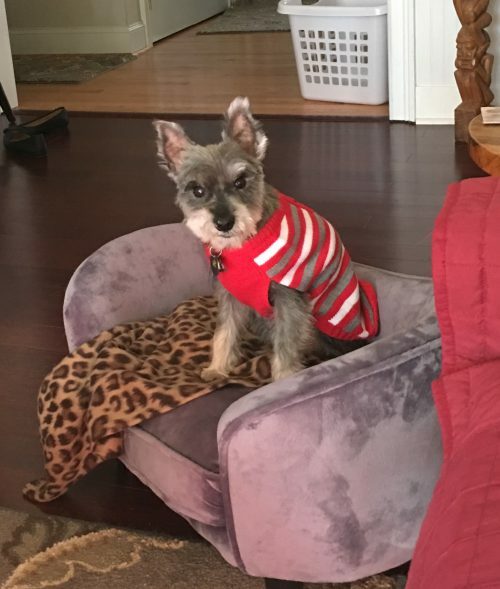 We had Karl’s DNA checked in February, and it came back that he was a purebred Miniature Schnauzer. We were blown away! Where did he come from? 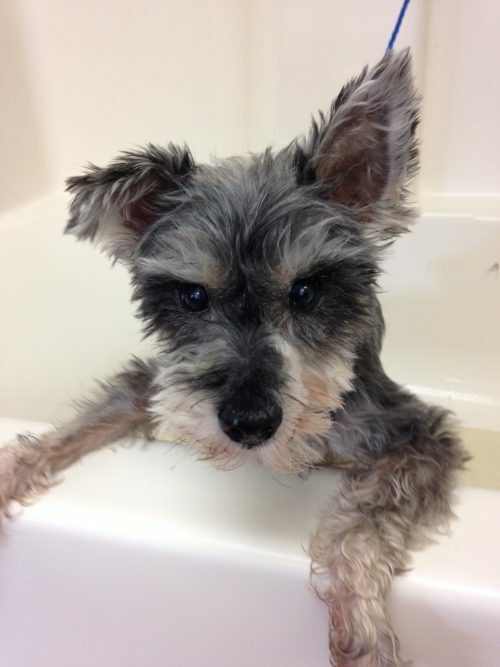 The only thing we could think of was he escaped from a puppy mill. That would explain his hunched back (being locked in a small cage) and not having his teeth taken care of. We didn’t care, he was our baby boy. At the end of May, while being groomed, a lump was found on the bridge of Karl’s nose. We took him to our vet immediately, and they weren’t sure what it might be. We needed to take him to have dental X-ray’s done to see if it was anything serious. They put him on antibiotics in case it was an abscess from possible fragments of teeth that may have not been removed. The antibiotics seem to do the trick because the lump went away. 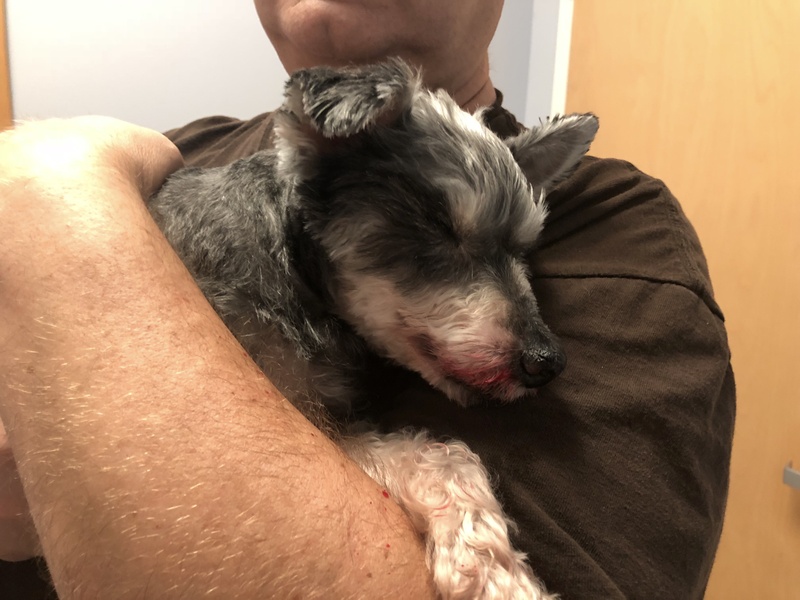 In early June, Karl had the x-rays and some minor surgery to fix a hole in his gums where the bone was starting to show through. The x-rays were sent to a Dog Dentist, and he wanted to see Karl. At the same time that this was going on, Steve’s dad was dying, and we were in the midst of taking care of him. Karl was doing great and not showing any signs of problems. We went for a consult at the end of June with an actual dog dentist that NC State sends their dogs to. 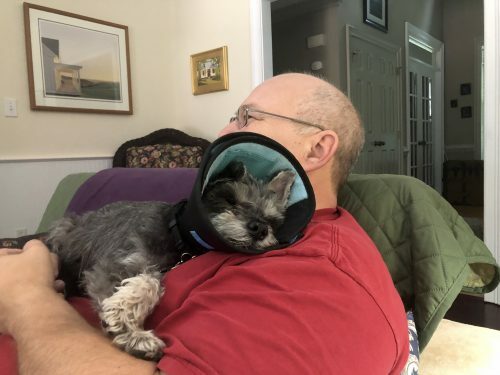 He’s a wonderful vet, and he wanted to go in and clean up the area where the lump had been. Karl had the surgery, and the doctor felt it was just a bone infection. He cleaned it up but just to be sure he sent a sample off for a biopsy. A week later he called and was stunned when it turned out to be maxillary osteosarcoma. Bone Cancer. He’d never seen it look like this before and the characteristics were not that of bone cancer. Needless to say, we were devastated! The prognosis from the first sign of symptoms was 3-4 months. Two months had already gone by. They could remove Karl’s upper jaw and do radiation and chemo, but that would only give him a year or so. Steve and I just couldn’t do that to Karl. 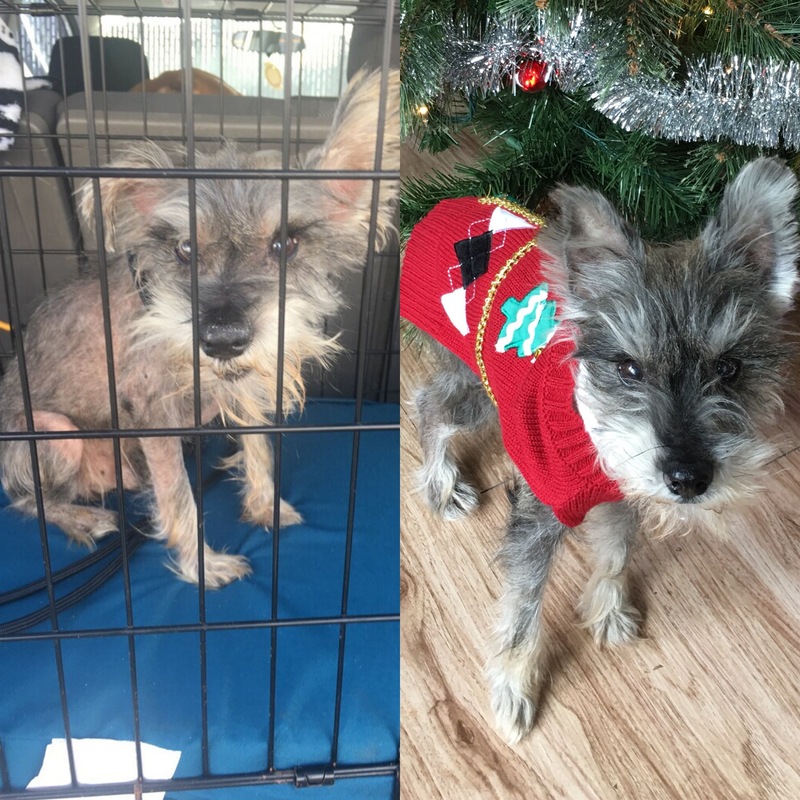 This little guy had been through so much in his life, so we decided to go with palliative care for him. We took him to an oncologist and they checked him to see if it had spread to other parts of his body, for this is a very aggressive form of cancer. It had not spread, so this was good. Karl didn’t act as if he was sick at all. So we put him on Palladia every 48 hours to hopefully shrink the tumor enough so that he would not be in any pain. 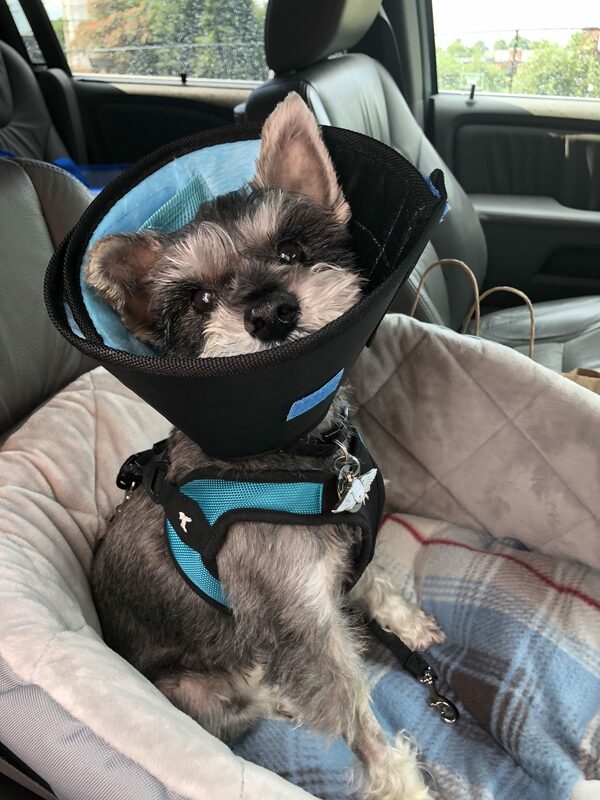 If there came a time when he had pain, we would have pain medication to give him until he was no longer happy and comfortable. Karl did great on this treatment for several more months. He would eat like a horse every morning and night. He lived for his treats after coming back in from going potty. 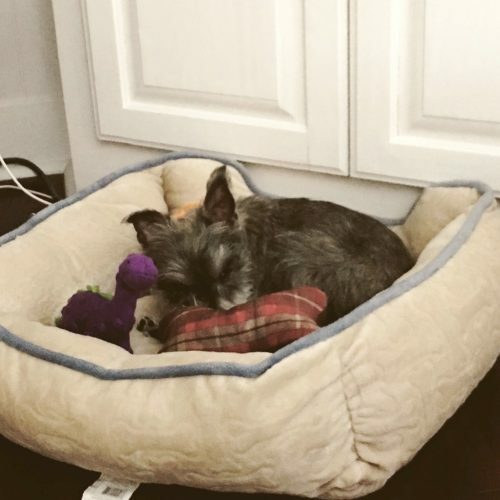 He played with his toys every night. He especially loved a squeaking rubber boot that we found in Alaska that the girls never played with and his rubber luffa dogs that squeaked as well. Our problem came last weekend when he started having nose bleeds. At first, we controlled them with Neo-Synephrine. But over the weekend they got worse. On Monday morning, October 15th, Karl had a severe nosebleed and was choking on the blood. Steve and I decided we couldn’t see him suffer. We called our incredible vets at Wake Forest Animal Hospital, and they said to bring him right in. 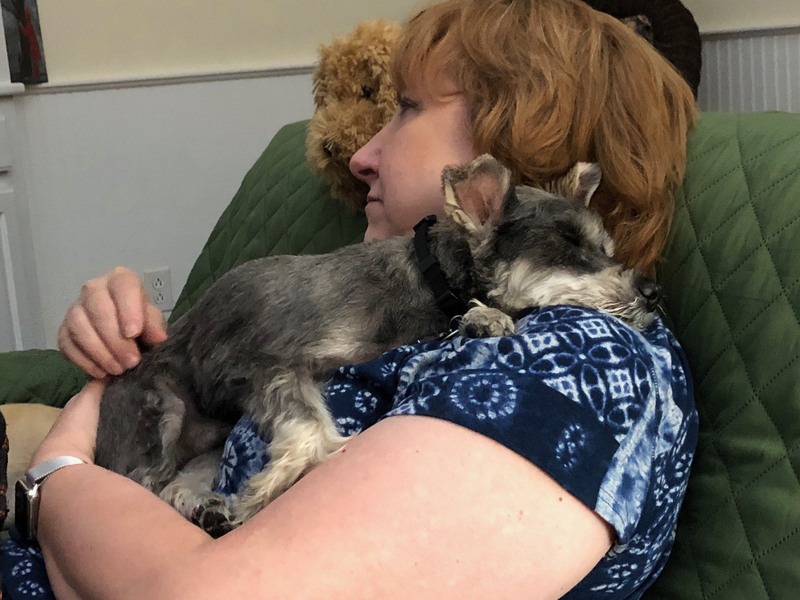 At 10:30 AM with Steve holding him in his arms and me rubbing his head telling him how much he meant to us, our little boy, Karl, died peacefully, knowing that he was loved more than anything. I told him to go find Dude at the Rainbow Bridge, and he would take care of him until one of us could get there, and we would cross the bridge together. RIP our sweet boy, Karl. Mom and dad love you.